Everyone welcome to attend and share the love of poetry. 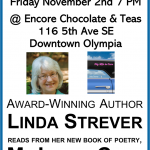 Linda’s Book will be available at the event or you can also order copies of the book in our Bookstore. 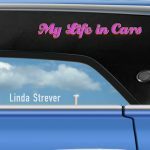 My Life in Cars by Linda Strever Tentative Release Date: Oct 15, 2018 Through a myriad of experiences with cars, these poems explore the events, relationships and evolution of a woman’s life. For complete details and ordering information click here.